The scruffy blue motorcycle fitted with two gas tanks and a tandem seat stopped me in my tracks. Standing in the Wheels Through Time Museum in Maggie Valley, NC the realization dawned that I was looking at a piece of nearly forgotten history. The prototype Hedstrom V-twin engine made its first appearance on August 5, 1904 at Newport Beach, RI on the first Indian V-twin. The 3hp V-twin was run in Orange, NJ on November 26 and raced at Ormond Beach in January 1905. One might consider this to be the origin of factory race programs being used for retail product development since the new 2.25hp single-cylinder engine, designed to power the new Indian Tri-car, was in production by November 1905. 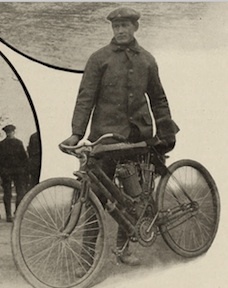 Oscar Hedstrom and his new V-twin Indian at Ormond Beach, FL in January 1905.
these was the Indian Double Cylinder Racer rated at 4 hp, weight of 108 lbs. and priced at $350. The new V-twin was patterned after the factory racer and didn’t have twist grips or fenders. The gas tank was a torpedo design that straddled the horizontal bar of the frame and not the camelback gas tank on the regular model. Other details were pedals with toe clips (just like those on modern bicycles), shorter handlebars, and the crank chain didn’t have a metal guard. It was fitted with a special split saddle positioned behind the seat tube. 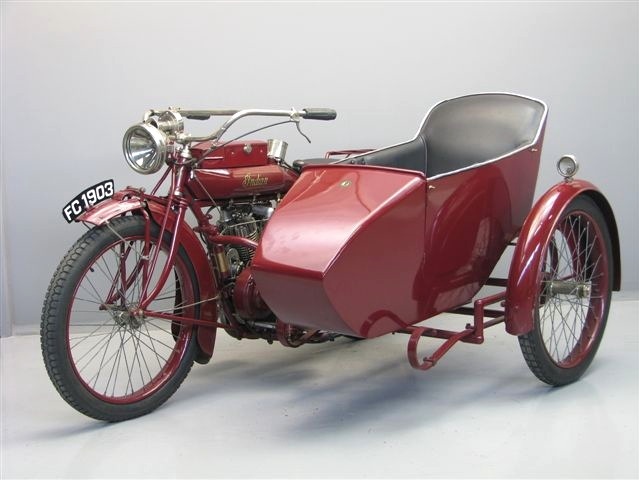 The 1906 sales was titled: “Indian Motocycle, Which Renders Possible the Indian Tri-Car Indian Tricycle, Indian Tandem, Indian Triplet, and the Indian Van. Substantially Six Vehicles In One.” These six variations of the 1906 Indian were based on two attachments, a rear tandem seat and a chassis that replaced the front wheel of the motorcycle with a frame having two parallel, steerable front wheels. It was the French El Dorado. Iroquois legends spoke of blond men rich with gold and furs that lived north of the Saint Lawrence River. Whether it was based on early Norse settlers who arrived in Newfoundland centuries before or a fabrication created to appease early French explorers and traders is unknown, but in 1536 Jacques Cartier discovered the entrance to a great fjord and his interpreter explained that it lead to the Kingdom of Saguenay. Fluorescent reds, oranges, and yellows have streamed across my vision for most of a day while riding north through Vermont and the Eastern Townships of Quebec. Immediately after crossing the 1.6-mile long Laviolette Bridge over the Saint Lawrence River into Trois-Riveries it was time to pull into the Coconut Motel so my retinas could rest. Inside, the deep red light punctuated by day-glo blue in the surreal tikki and wicker Polynesian palm-frocked motel bar seemed almost normal in comparison. The Saguenay is often described as being an oasis in the wilderness, yet it is not difficult to find. One only has to follow Interstate 91 north to the US-Canadian border at Derby Line, Vermont where it becomes Autoroute 55, that eventually becomes two-lane Route 155. When Route 155 ends at on the shore of Lac-Saint-Jean you’re in the Saguenay. Settled in 1608, Trois-Riveries (Three Rivers) was the second permanent settlement in Quebec, but its importance diminished after a fire destroyed most of the city in 1906. The downtown area of this old mill town has dozens of cafes and restaurants whose tables spill onto the sidewalks of Boulevard des Forges making this a popular weekend destination for regional riders. The J. C. Van Horne Bridge spans the Restigouche River. 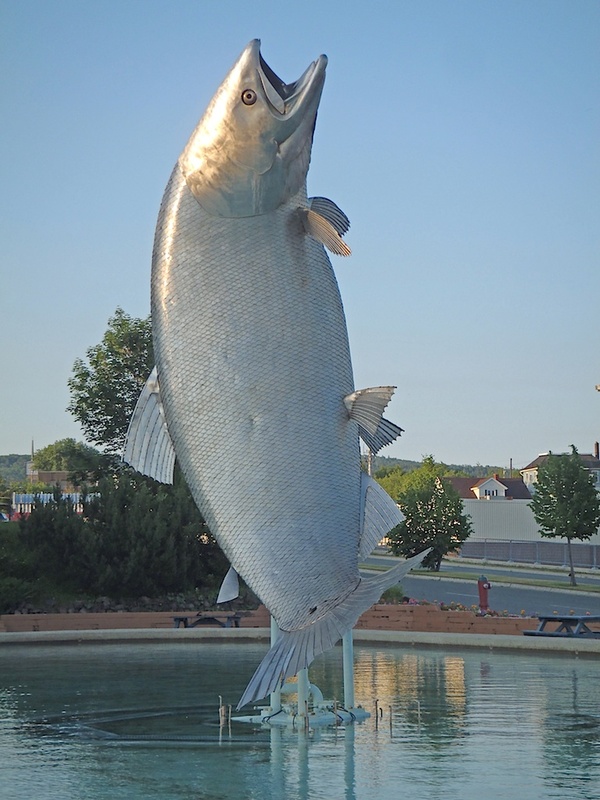 The world’s largest salmon leaps from a concrete pool, its stainless-steel scales glistening in the early morning sun as the dark waters of the Restigouche River flow into Chaleur Bay. 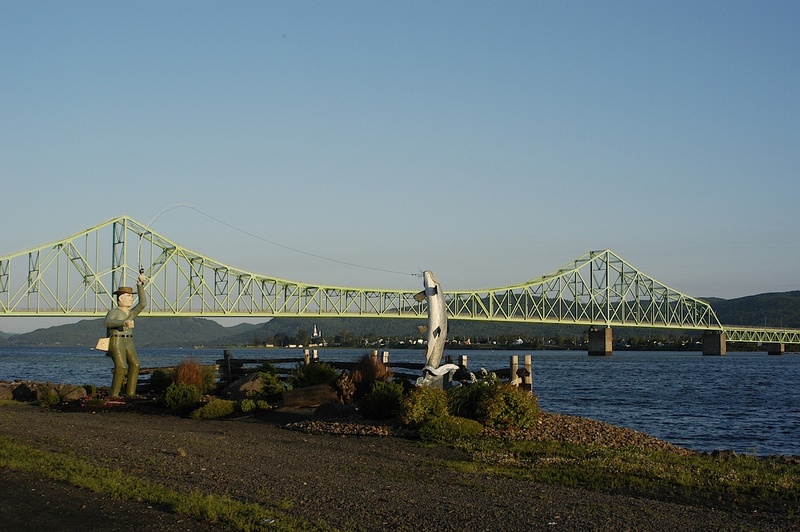 Crossing the J. C. Van Horne Bridge from the Gaspé into Campbellton, New Brunswick leaves Quebecois culture behind and I enter that of the Acadian. The Acadian Coast extends from the mouth of the Restigouche River east along the southern shore of Chaleur Bay to the tip of Miscou Island, then south along the Gulf of St. Lawrence into the Northumberland Strait between the mainland and province of Prince Edward Island. The Acadian Coastal Drive is clearly marked by red signs with a white starfish logo. Most of Route du littoral acadien avoids the main highways favored by truckers and people in a hurry so it’s perfect for motorcycling. Following a coastline that is almost the mirror image of the southern Gaspé peninsula I reach the city of Bathurst. This is the southernmost point in Chaleur Bay and Miramichi is the westernmost point on the province’s gulf coast. The later lies directly south of the former city with only 43 miles separating them via NB Hwy 8. Everything to the east is the Acadian Peninsula and The Acadian Isles. No bones about it: Moto-Foodie Heads South to Cayo Hueso. 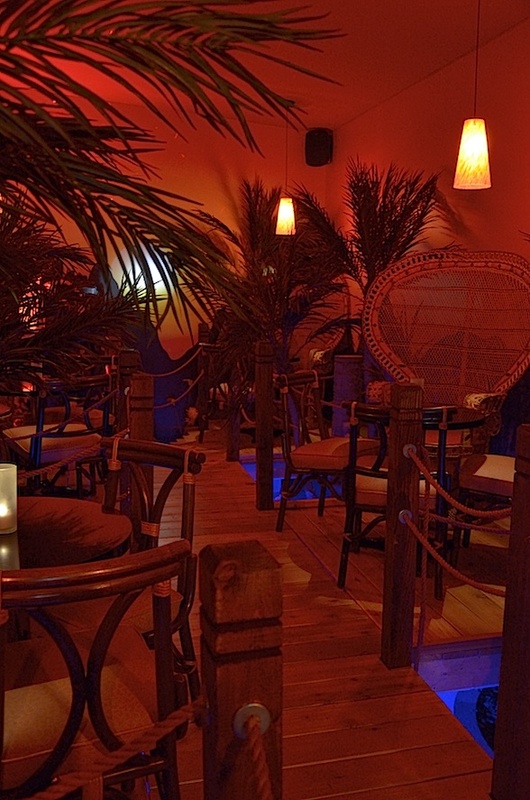 One does not have to board a plane or boat to experience the Caribbean Islands. Jump on a motorcycle and there’s another 127 miles of highway south of Miami before one runs out of pavement on Cayo Hueso, the Island of Bones. 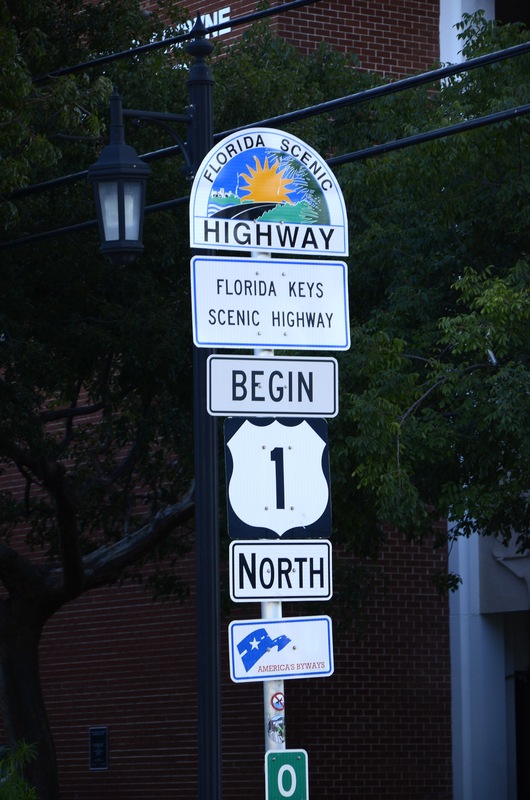 The Overseas Highway, U.S. Route 1, connects “The Keys” like beads strung on thread that are spaced by 43 bridges. There’s no other stretch of pavement like it, but sometimes the 100-mile conga-line of traffic diminishes what otherwise would be one of the great motorcycle roads in America—and I wouldn’t want to ride it when there are high winds. U.S Rt. 1 ends at mile 0. While this is not the westernmost island, it’s as far as the highway goes. The word “key” is actually the Spanish word “cayo” for a low-lying island. Ponce de Leon, of fountain-of-youth fame, discovered Cayo Hueso in 1513 and the imaginative Spaniard named it for the proliferation of human bones discovered here: the Spanish name is pronounced Kéy Wes. The 8.5-mile-long bridge system skips across four of the Thousand Islands that choke the headwaters of the St. Lawrence River. 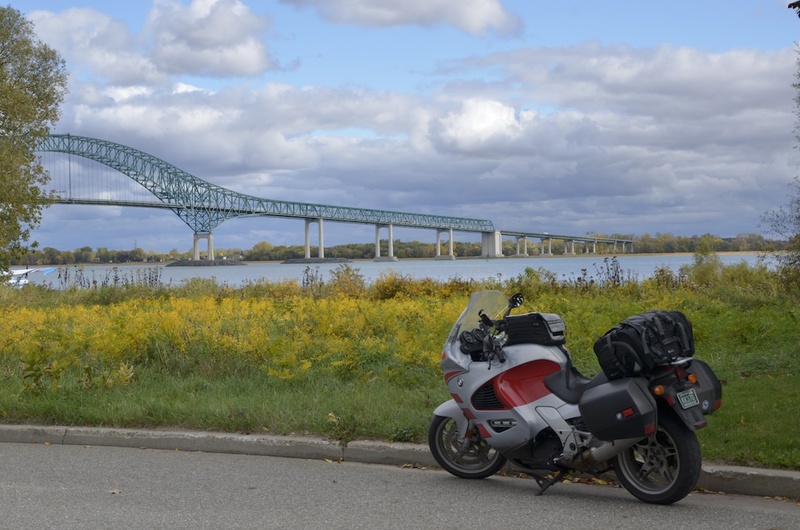 New York now lies behind and the beautiful Thousand Islands Parkway leads west along the northern shore of the river to Gananoque, where I pick up Route 2 for the last few miles into Kingston, Ontario. 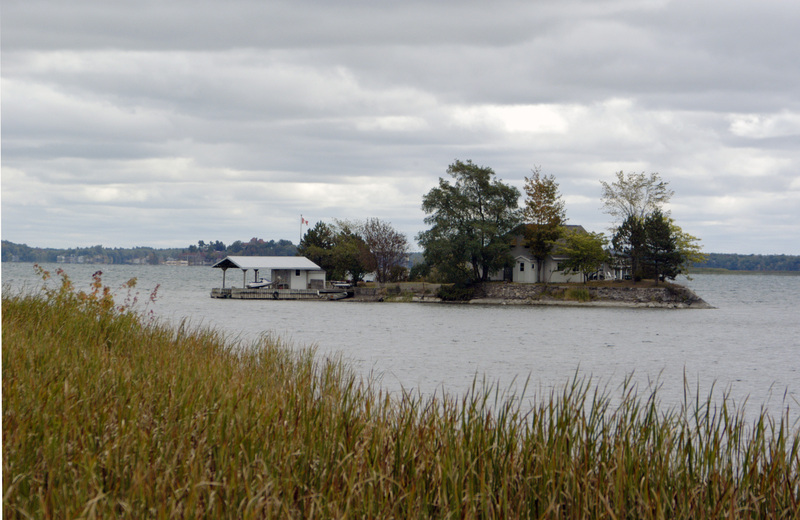 Strategically placed where Lake Ontario empties into the St. Lawrence River, this small city was Canada’s original capital from 1841 to 1844 and has a history that goes back to the first fort constructed at this site in 1673. Like most places, Kingston has had its ups and downs, but right now it’s definitely up. 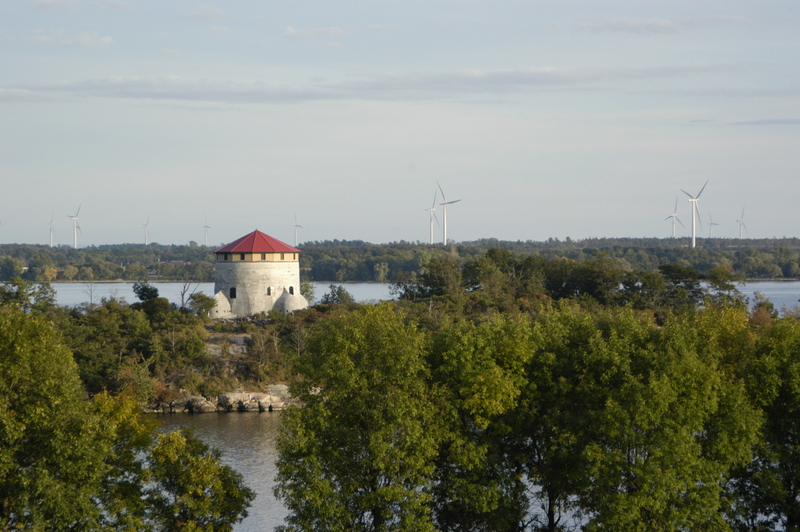 The massive walls of Fort Henry dominate the heights above the harbor and four Martello towers protect the entrance to the once strategic Rideau Canal. Constructed between 1832 and 1836, the canal was a military undertaking to connect Lake Ontario to the Ottawa River. During the decades following the War of 1812, the British were concerned that the United States might once again invade Canada to capture the vital St. Lawrence River and cut off supplies to the British naval fleet in the Great Lakes. The canal never was used for military purposes, but until the railroads arrived in the 1850’s it was of vital commercial importance. This is the oldest continuously operated and original canal in North America and was designated as a UNESCO World Heritage Site in 2007. I’ve come to ride the land-based roads that follow this historic canal from the old Canadian capital to the new. My first destination is the Kingston Brewing Co. where I can get a Whitetail Cream or Dragon’s Breath Ale, a Regal or Dunkelnacht Larger, a Guinnes or McAuslans Stout, or any number of bocks, bitters, and brews that I’m not familiar with. They also stock over a 100 different single-malt whiskies. The food is as stupendous as the bar. I settle for some fresh-cut chips, Ghetto Style Dragon Wings, and a Buffalo Burger. The buffalo is raised on a local farm, chicken and pork ribs are smoked in-house, and I haven’t a clue as to where they get the dragon wings. There are other great restaurants in town, but I’m a creature of habit and keep returning to this one. The end of the road has become an almost mythical place in our modern collective imagination; the place where a person runs out of options and must turn back or begin anew. The objective truth is that most highways don’t simply stop. Rather, they merge with or junction at other roads so travelers can roll on to their next destination. Yet here I am. The official highway sign says “FIN” and behind it lies a wild untamed river. I’ve been told that Quebec intends to extend the road all the way to Labrador in the future, but for now Route 138 ends at the Natashquan River. It’s my father’s fault. At a very early age he instilled in me an insatiable curiosity about where a road might lead. On Sunday rides he’d spy a road and ask, “Where does this go,” and our family would be off on a minor journey of discovery for the remainder of the day. Route 138 is a familiar highway. It crosses the Mercier Bridge and becomes Rue Sherbrooke, an intimate part of Montreal that’s less than a mile from home, while the Chemin du Roy to Quebec City and even through the Charlevoix Region to the Saguenay River is well-known territory. Eight hundred and sixty miles long, it stretches from the New York border at Trout River to Natashquan on the shores of the Gulf of St. Lawrence and 500 miles of that is east of Tadoussac. But what lies beyond Tadoussac? What will be found at the end of the road? I had to know. I discovered the Petrol-Cycle on the front page of the February 14, 1891 edition of the Scientific American. 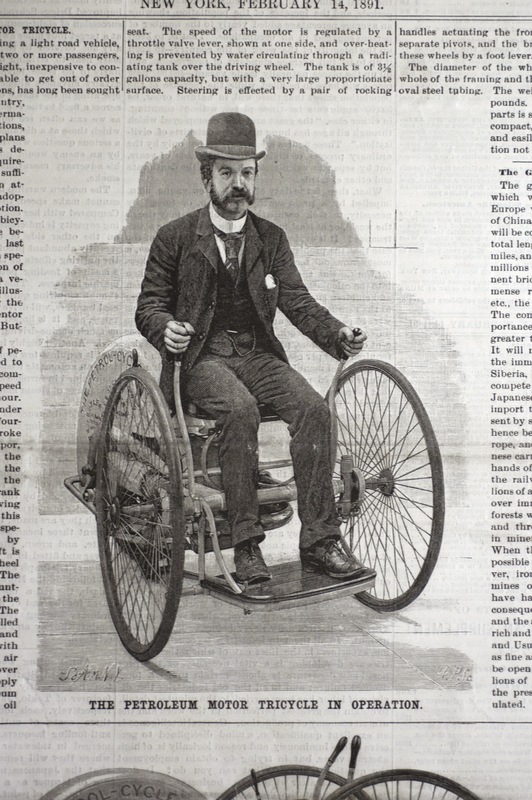 Invented by Edward Butler of Greenwich, England, this three-wheel fore-car had an elegant 650cc twin-cylinder, four-stroke, water-cooled engine with electric spark ignition. 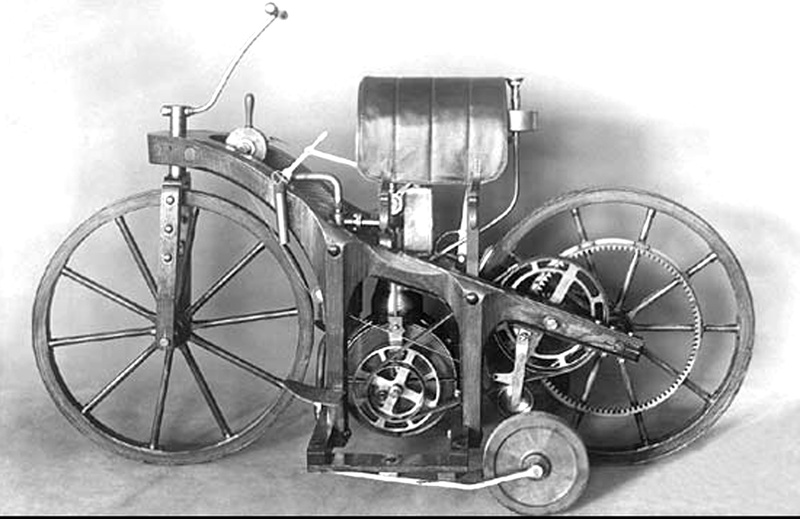 Years ahead of DeDion and Boulton, the Petrol-Cycle made Gottleib Diamler’s “Reitwagen” look like something from the Medieval Period. Regardless, most reference books about the history of motorcycles don’t even mention it. Butler designed his “Velocycle” while working for an engineering company and filed for a provisional patent in 1884 under the title “A petroleum motor tricycle or small automobile carriage since it is not provided with auxiliary pedalling [sic] gear and was fitted with a comfortable seat and footboard.” That year he exhibited drawings of the vehicle at Stanley Cycle Show in London and in 1885 at the Inventions Exhibition, but neither produced financial backing. Unknown to the English inventor, in Germany Karl Benz was developing his own gasoline-powered internal combustion engine, as was Gottlieb Daimler and Wilhelm Maybach. If you didn’t have it, you simply would die. Since you’re not dead, salt is part of your diet no matter what you think about “low” sodium or whether or not you’ve even pondered about the most important culinary garnish in mankind’s history. However, if you think of salt as being that white stuff in the shaker that’s found in every dive, diner, and four-star restaurant then you’re not on the flavor trail. Salt is a mineral known as halite and more commonly as the compound sodium chloride. Both sodium or chloride will quickly kill you, but without the compound made up of these two elements you’ll also die. In the history of mankind salt was often worth more than gold and elaborate trade routes were established to transport this commodity. Roman soldiers were paid in salt (hence the word, salary); wars have been lost and won over salt (including the U.S. Civil War); and it is mined in places most people never imagine (1,000 feet beneath Detroit are over 100 miles of tunnels and 1,500 acres of salt production). The elaborately carved, palace-like chambers in the salt mines of Wieliczka in Poland are a UNESCO World Heritage Site and over a quarter of a million tourists visit the Khewra Salt Mine in the Crystal Valley region of Pakistan each year. Obviously, there’s a bit more interest in this than “please pass the salt” at the dinner table. Change comes slowly here. Many of Vermont’s roads were built a couple of centuries ago when oxen pulled wagons. Merely covered by asphalt these narrow serpentine roads still undulate across the landscape through the moist shade of forests interspersed with fields bordered by stonewalls. It’s motorcycle-riding paradise. In 1749 Bennington became the first town charted in what was a frontier wilderness known as “The Grants.” Located just a few miles north of Massachusetts and on the border with New York a majority of riders coming to Vermont pass through this crossroad. On West Main Street—Route 9—I pull into the Hemmings Motor Oasis Sunoco. 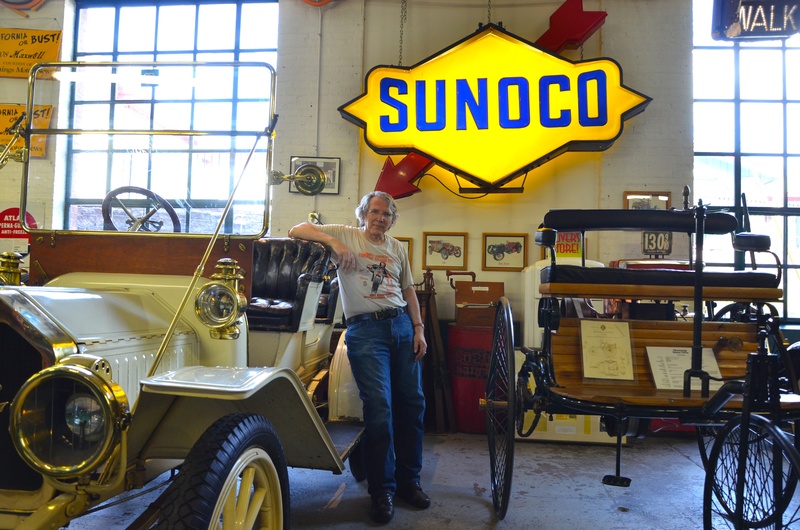 This is more than just a gas station: next door, in the basement of a converted factory building, is the Hemming Motor News museum that’s jammed packed with vintage and antique vehicles. 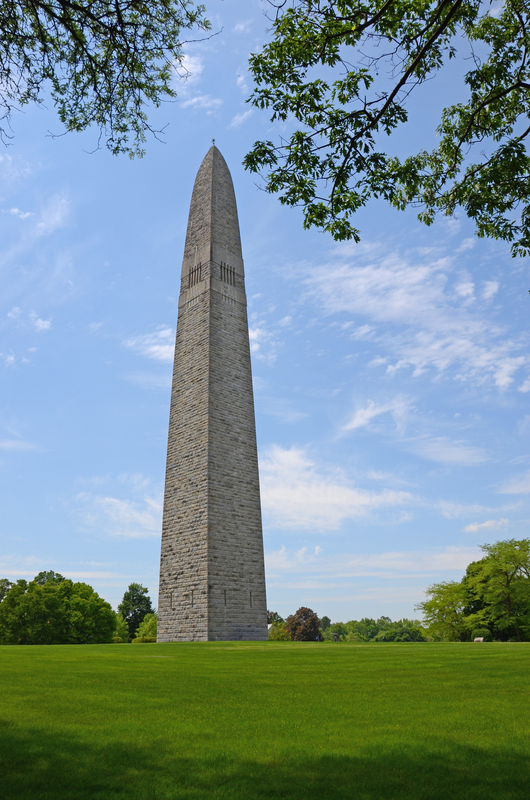 The Bennington Battle Monument is the tallest building in the state. Old Bennington holds some of Vermont’s earliest history. Old First Church (c. 1805) is considered to be one of the finest Federal-style churches in New England and in the Old Burying Ground headstone markers date back to the Battle of Bennington. Yet, it is the 306-foot high monument of gray dolomite that commands attention. The Battle of Bennington, the turning point of the Revolutionary War, actually took place in nearby Hoosic, NY but this marks the site of the critical storage of militia supplies that British intended to capture. Today I simply loop around the monolith and head for North Bennington, crossing the elegant, red-painted, Silk Covered Bridge over the Walloomsac River. 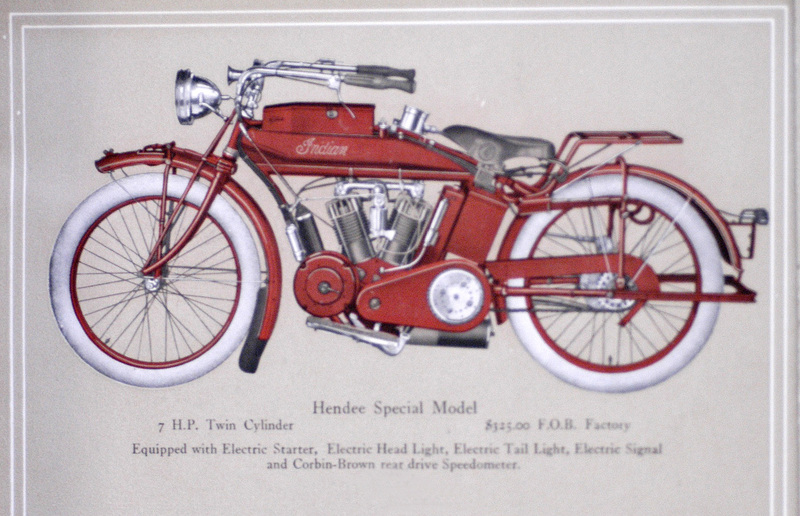 Hendee Special — 1914 sales brochure. The two-speed gearbox was introduced in1910 and the success of the Indian race team at Isle of Mann in 1911 led to the design of the Tourist model the following year. The Tourist models featured dual rear brakes (drum and band), knockout axles, roller bearings on the rear hub, and were fitted with the new Gustafson kickstarter. 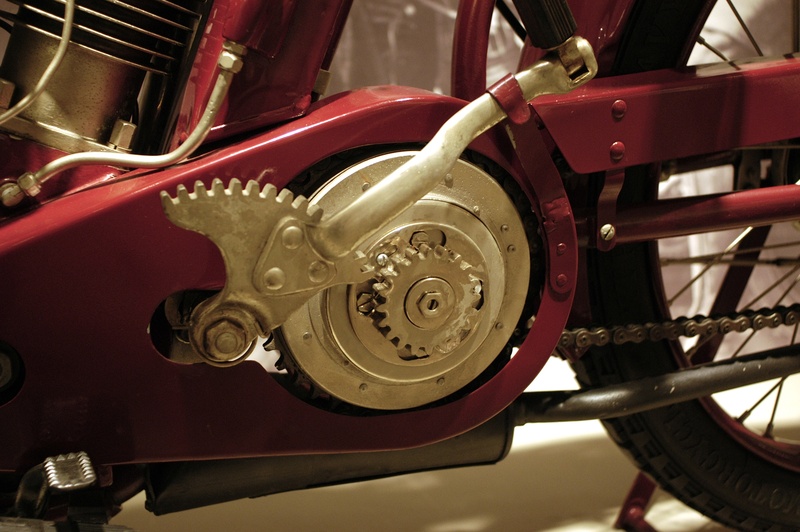 The innovation for 1913 models was the “Cradle Spring Frame” that, along with the front leaf spring of 1910, provided the first complete suspension system for a motorcycle. Something impressive was required for the next model year. 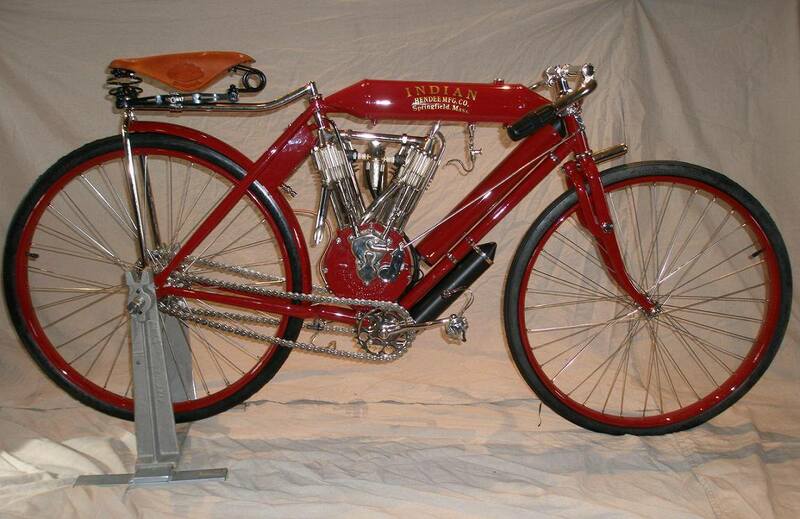 Seven Indian models were introduced for 1914, one with a single-cylinder engine and six V-twins. The Hendee Special was the elite model and featured the first electric starter used on a production motorcycle. Unlike on the other two electric models where the batteries had to be removed and manually recharged every 12.5 hours (or less), the starter motor also functioned as an electric generator to automatically recharge them. Another innovation was the use of waterproof condenser coils to provide the spark, which improved the reliability and efficiency of ignition and certainly made starting easier. It was a brilliant design and it utterly failed.